This first full year of blogging has been a great experience. With each post I learn a little more about the process, and it is certainly exciting to see more and more people visiting the page! 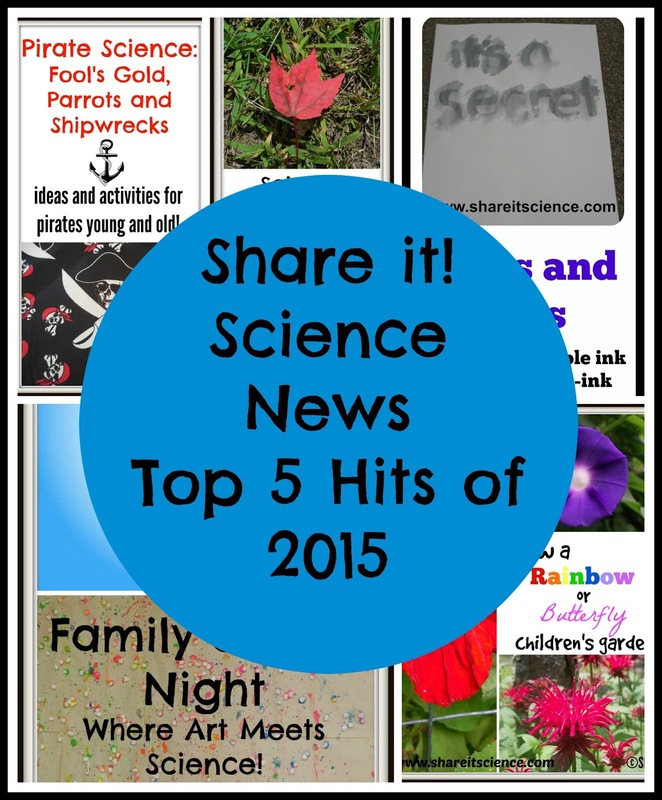 Here are the top 5 most popular posts from Share it! Science News this year. They are almost all activity-based, in fact 2 are from my series, "Saturday Science Experiment", which tells me I need to focus on writing more of this type of post in the future! 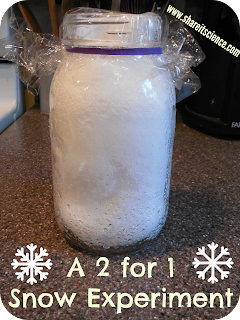 This is an experiment that can be done at school or at home, throughout different parts of the year. Through the process of chromatography, you can see the different pigments in the leaves! I have KC Edventures to thank for the widespread popularity of this post, as it was featured on their post: 20 Awesome Outdoor Fall Activities. This was one of my favorite posts to put together this year, and it has been very popular. There are 2 tutorials for invisible ink- neither require heat, as well as a no-ink fingerprinting activity! 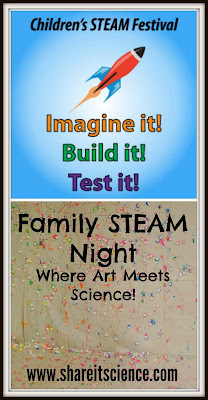 #3 Children's STEAM Festival: Family STEAM Night- Where Art Meets Science! This post is great for schools who want to host a Family Science Night, or for those who like to do family-friendly science activities at home. We're putting Art into the mix of traditional STEM to make STEAM (Science, Technology, Engineering, Art, Mathematics). Catapult painting, calculating angles of gigantic snowflakes, bubble painting, DNA models and more! This was part of a series called Children's STEAM Festival, a partnership between Share it! Science News and Growing with Science. If you like this post, be sure to check out the others in the series! A very popular post in the spring of 2015. 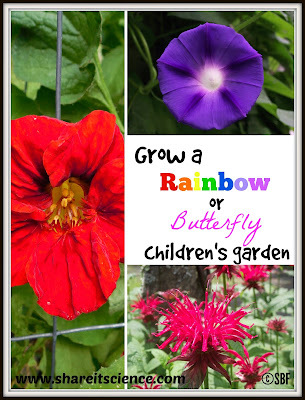 Ideas for growing themed rainbow or butterfly gardens with children. Definitely one to bookmark or pin for when warmer weather comes! It's never to early to get planning! 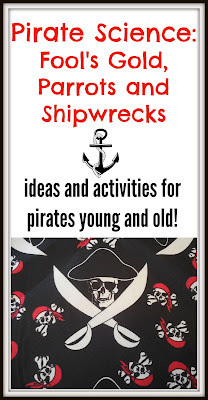 I wrote this post as part of Peakle Pie's "Talk Like a Pirate Day" Blog Hop. I love pirate lore and science, so it seemed like a natural fit! Kids activities for testing your rock collection for gold, some parrot science and research and info on fascinating shipwrecks. ARHHHH! Did you like these activities? Don't miss any more Share it! Science News posts! Subscribe by e-mail on the right-hand sidebar. We never send anything spammy, just science fun! Check out our Pinterest Boards too! Not too long ago on one of our early morning dog walks (in the dark with headlamps and reflective gear this time of year) we came across a porcupine. We were walking along and suddenly my dog lunged toward something on the side of the road that then began to slide down the banking backwards towards us. Quickly recognizing the black and white warning coloration and having come across these large rodents on walks before, I pulled the dog back before any harm was done to either party involved. Luckily, porcupines are not the most fast-moving or graceful creatures! Although a face-full of quills can be very dangerous for pets and other would-be predators, porcupines are by far one of my favorite animals. You probably have not heard many people say that, but there are probably not too many people who have had the same experiences I have had with them. When I graduated college I got a summer internship at Squam Lakes Natural Science Center. The center educates about wildlife and has a non-releasable wildlife collection that serve as ambassadors for their species at schools, camps, after school programs, etc. That summer and the following two years as I was hired to continue working as an assistant naturalist I shared the porcupine with many audiences. Why do I love the porcupine so much? Incredible Adaptations: Although the porcupine has a poor sense of sight, they make up for it with excellent hearing and smell. Their most fabulous adaptation is their specialized hair. They have up to 30,000 barbed quills used for protection. One question I've been asked over and over is how far they can shoot their quills, well first of all THEY DO NOT SHOOT THEIR QUILLS!! They can raise and lower their quills just as your dog or cat may raise its fur when agitated. By lashing their tail back and forth and moving towards another animal, the quills easily dislodge from the porcupine and into the other creature. The porcupine has no mechanism for shooting quills out of its skin. The quills are barbed on one end, making them very difficult to remove. If you or a pet ever were to be quilled it is crucial to remove the quills as quickly as possible as the contraction of muscles pulls them deeper inside. Quills are not the only type of porcupine hair. 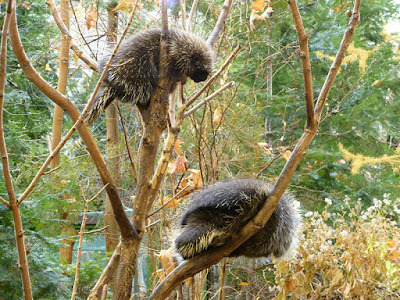 There are bristly hairs on the tail that help the porcupine keep its balance while up in trees and warm fuzzy underfur to keep the porcupine warm. They also have long guard hairs that help them to know their surroundings, just like a cat's whiskers. Vocalizations: Porcupines make a variety of sounds for communication. Although it is easy to anthropomorphize because some of their sounds resemble human words, we cannot tell what they are saying. However, it is endearing, and that is probably why Teddy Bear the porcupine from Zooniversity has become so popular. Keep in mind that porcupines in the wild are not eating pumpkins and corn on the cob like Teddy. In their natural habitat they browse on hemlock twigs, and eat an herbivore diet of leaves, bark and soft plants like skunk cabbage and clover. Baby porcupines: A baby porcupine is called a porcupette! They are born with soft quills that harden within hours of being born. The porcupine only has one baby at a time, and the young porcupette will stay with its mom for about 6 months after it is born. 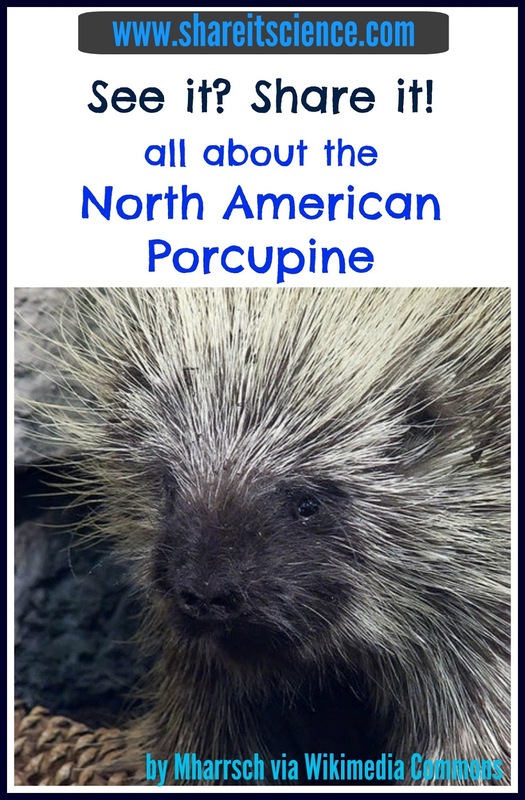 There are so many other fascinating facts about porcupines. Did you know that they are the second largest mammal in North America? (Do you know what the largest is?) Porcupines have also gone by other names historically, like quill-pig and similarly Stachelschwein, which means "thorn-swine" in German. For a thorough summary of the porcupine, visit Animal Diversity Web's page on the animal. 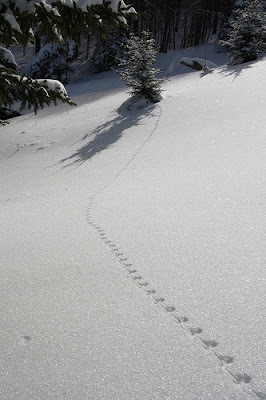 I am sure that we will observe porcupines again on future ventures in the forest or on the dirt road near my home. Although I love them, we always try to keep our distance! Folkmanis makes excellent, realistic puppets that are great for teaching young children about animals. Check out their porcupine here. What better way to explore porcupine quills than examining them up close? With guidance students can explore these specialized hairs under a magnifier or microscope. Purchase them here. Share it! Science News wants to wish you a very happy holiday! 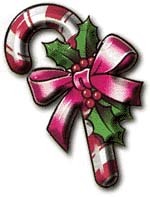 We appreciate your readership, it is truly a gift! Are you looking for some activities to keep the kids busy over winter break? 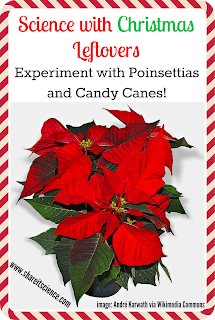 Check out these Christmas and winter holiday themed activities! Check out these winter season science and STEM boards on Pinterest! So many activities for all ages. Have fun learning! 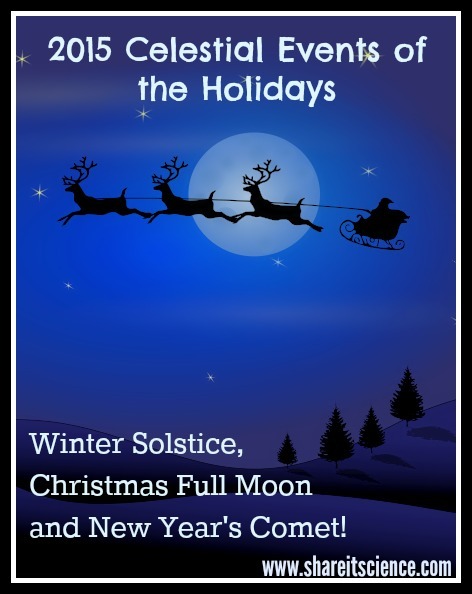 The next couple of weeks hold some special events in the night sky, the Winter Solstice, a Christmas Full Moon and a New Year's Comet! We experience 2 solstices and 2 equinoxes each year. The solstices, in winter and summer, are when Earth is getting the least direct sunlight due to the tilt of our axis, and the most direct sunlight. To better understand our Earth's axis and the changing seasons, check out my post: The Changing Seasons: So Much More Than Temperature! This is a topic laden with science misconceptions held by children and adults. Do you think you understand the concept of seasons? 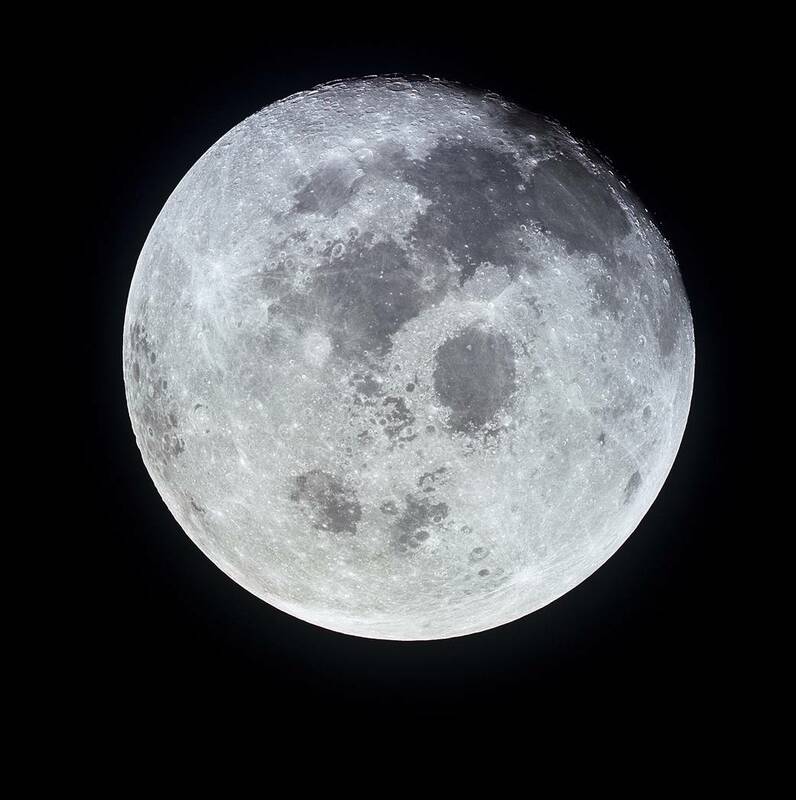 Did you know that the last full moon of December is called the "Full Cold Moon" because of it's proximity to the start of winter? This year, we will experience a Christmas full moon for the first time since 1977. 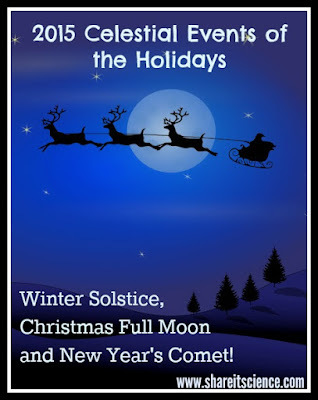 It won't happen again until 2034, so be sure to look up for this celestial Christmas gift! Catalina, a comet discovered and named after the Catalina Sky Survey in 2013 is making its way across the sky in the next few weeks. 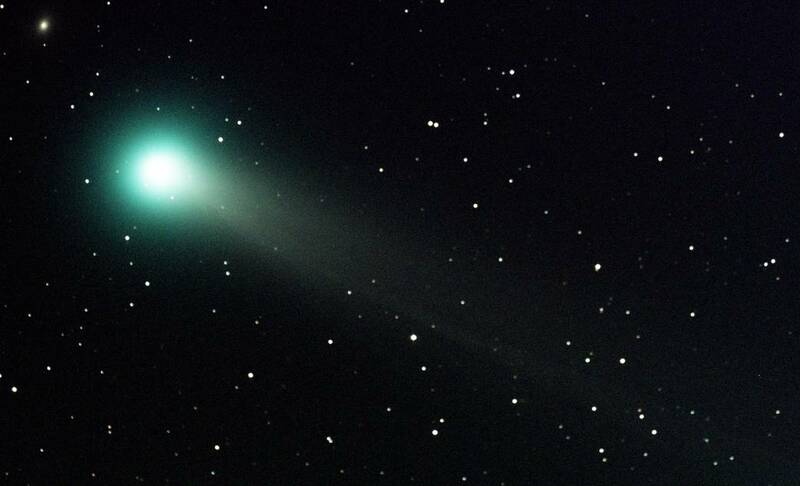 Star gazers are hoping for some naked-eye viewing of the comet to help ring in the New Year. Although the comet will pass closest to Earth on January 17th, there are great opportunities to view it on the evenings around December 31st. To locate the comet, you'll need to find the constellation Bootes. Find the reddish star Arcturus and near the star you should see the fuzzy tail of the comet. A pair of binoculars will help! For some tips and resources for helping navigate the night sky digitally or with a star map visit this post and scroll to the resource section. "Baby Beluga in the Deep Blue Sea!" 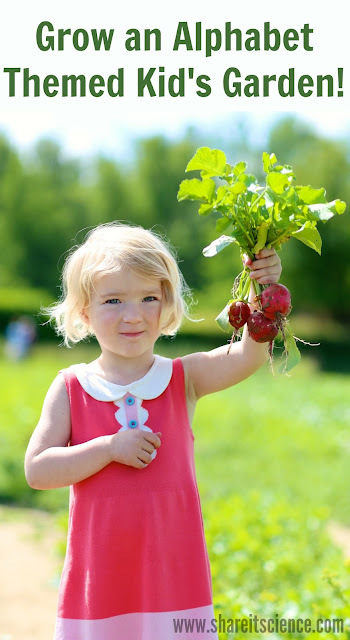 It is hard to get that old Raffi tune out of my head as I am writing this post. Beluga whales are fascinating and charismatic creatures. This recent research on them may be an interesting entry point to learning about this whale at school or home. 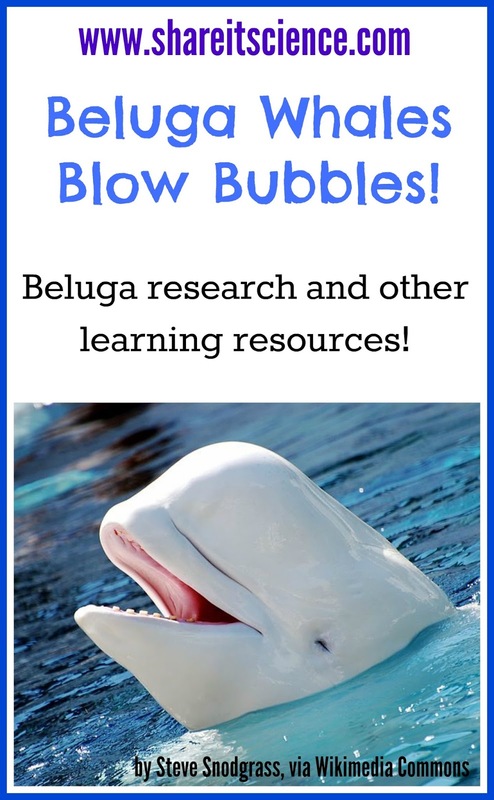 Did you know that beluga whales blow bubbles from their blow holes? Not only do they blow bubbles, but they can control the types of bubbles they are blowing, and scientists now believe these different bubbles represent the mood of the animal! It seemed odd for an animal that needs to hold its breath underwater to purposefully blow bubbles, so researchers were interested in getting to the bottom of the phenomenon. The research took place at Marineland of Canada in Niagara Falls, Ontario by a team of researchers from Canisius College. During the 8 year study they found that practically all the beluga whales blew bubbles in four source-shape combinations: blowhole drips, blowhole bursts, blowhole streams and mouth rings. The bubbles were produced by males and females, adults and juveniles. "Blowhole bursts" are part of the beluga's startle response. These are produced most often by adult females, indicating that in nature they are more reactive than adult males. Juvenile males made this type of bubble more often than females and researchers believe that this is because they engage in rowdier levels of play than the females. Although "blowhole streams" are a sign of aggression in humpback whales, the belugas exhibited this type of bubbling when they were swimming in a friendly manner side-by-side. The scientists found that some days the whales blew many bubbles and other days they did not. As the conditions of the aquarium were similar everyday, it seems very likely that the behavior is indicative of mood rather than environmental conditions. Imagine if we communicated with each other this way! There is a lot to learn about beluga whales. They are relatively small whales that live in shallow areas in arctic waters. It is the only species of whale that is known to be entirely white as an adult. If you live in New England, you are not far from the largest outdoor beluga exhibit in the United States, at the Mystic Aquarium in CT. It would be difficult not to become instantly smitten with these friendly whales that come to see you as you approach their enclosure. 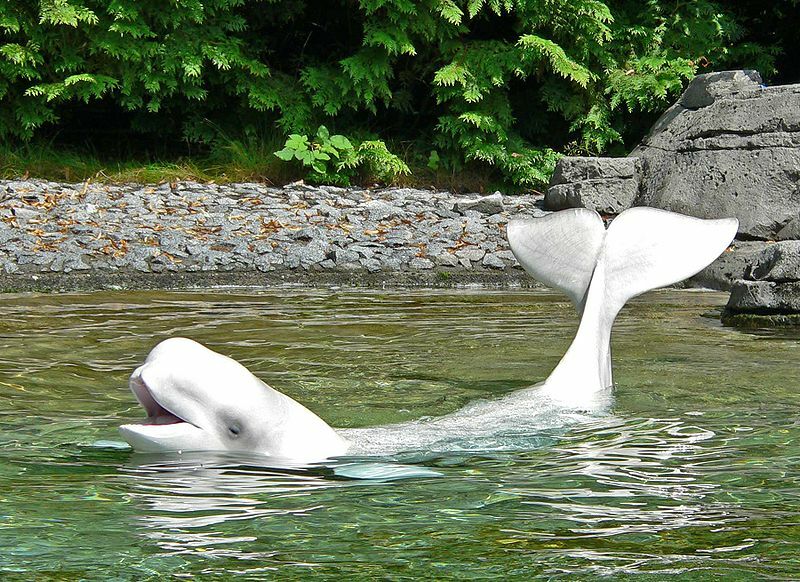 If you are unable to travel to an aquarium, check out the beluga cam from the Vancouver Aquarium! You might also want to check these books out for purchase or at the library: Beluga Whales: Animals of the Snow and Ice, Hello, Baby Beluga! (for early readers), and if you just can't get the song out of your head, like I can't, Baby Beluga, Raffi Songs to Read. Science Daily: "Belugas Blow Bubbles Based on Mood"
Meet the Mystic Aquarium Beluga Whales! Sing with me! "I'm dreaming of a green and brown Christmas!??" It has been a very warm fall in New England, a pattern that looks to continue throughout the start of the winter. Are you experiencing out of the norm weather where you live? If so, you can blame El Niño again! 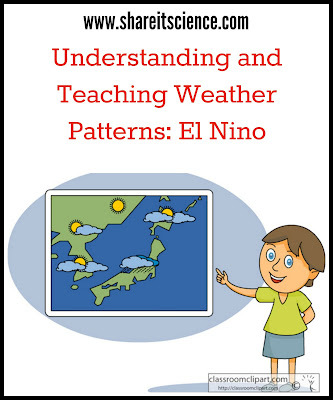 Every few years we experience the unpredictable weather pattern, El Niño. It is caused by warmer ocean waters in the Pacific. Under normal circumstances strong winds push warm water from South America to Indonesia. This allows the cooler water underneath to rise up. The surface temperature of the ocean water has a great impact on the weather because more clouds form over warmer areas of the ocean. During an El Niño, the winds are not as strong as usual and the warm waters do not move west as they do normally. 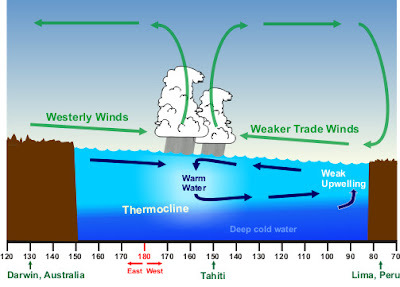 When the temperatures rise in the Pacific ocean, this affects the course of the jet stream. The jet stream is a strong wind high up in the atmosphere that can reach over 200 miles per hour. These winds help to steer weather patterns by moving air masses on the surface of the land and weather systems in the atmosphere. El Niño adjusts the position of the jet stream, giving areas weather that may be different than usual. Meteorologists with the National Oceanic and Atmospheric Administration (NOAA) predict that the United States will see wetter than average conditions in southern areas, and drier than average conditions for the Pacific Northwest, Hawaii, the Great Lakes and Ohio Valley area. Temperatures will most likely be above average for the west and the northern half of the lower 48 states and colder than normal in the southern plains and southeast. Meteorologists are anticipating many changes in weather patterns as this is one of the strongest El Niño events on record. Children and students will no doubt notice the changes in weather. I know many kiddos who are looking forward to snow sports and snow days! 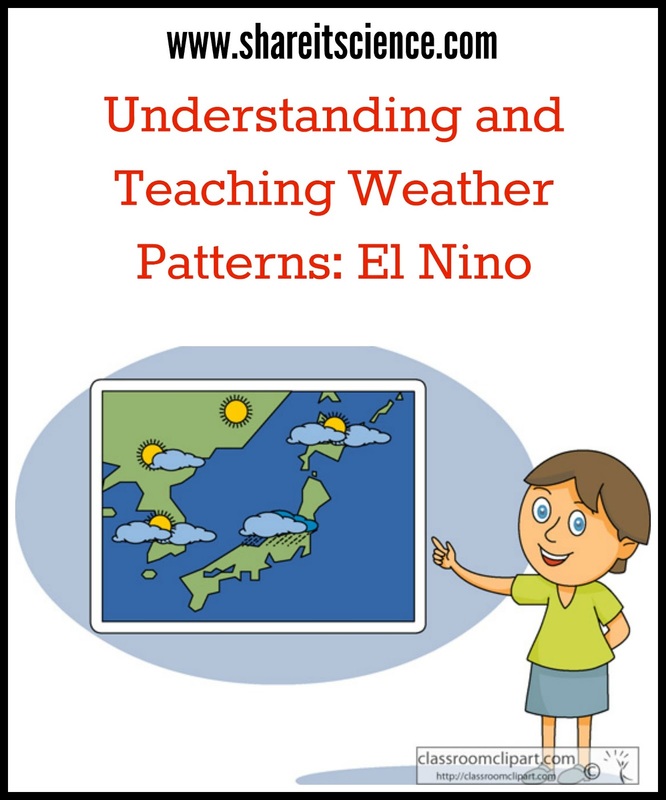 Below is some additional reading and resources to help you understand and teach about El Niño. 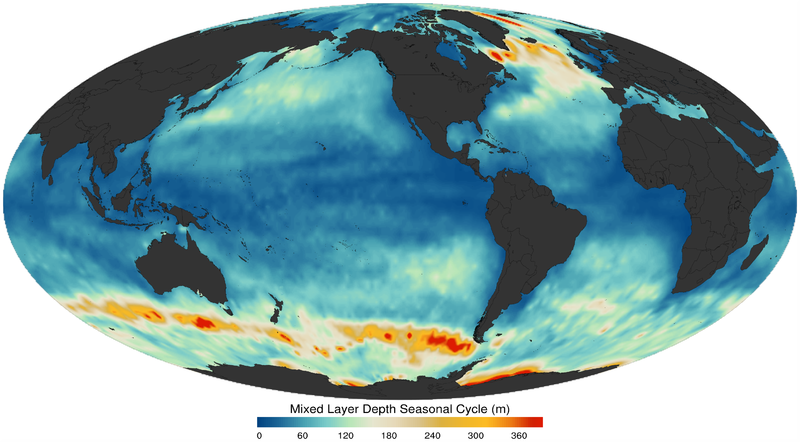 Science News for Students: "New El Niño Coming On Strong"
NASA's Climate Kids- What is El Niño? 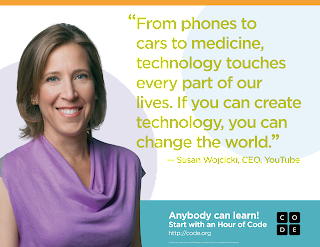 This week marks the 3rd Hour of Code international event. The Hour of Code is a grassroots effort to get people involved in computer coding and computer science. This event runs in early December in conjunction with Computer Science Education Week. Although there is a focus on getting everyone involved in coding during this week, learning to code is certainly not limited by dates. There are tons of activities and resources to teach kids to code throughout the year. This post contains affiliate links. Please see disclosures for more information. What is wonderful about learning to code is that anyone can do it. You don't even need to be sitting at a computer! The basics of computer coding rely on patterning and sequencing. These are excellent critical thinking skills that are the backbone of many disciplines including science. Learning to code allows us to take a science and technology skill and create something new. Although I advocate for children spending time outside and playing with things that do not have screens, I believe that learning the basics of coding at a young age puts students in a better position to learn computer science and other sciences as they grow up. The reality of our world is that it is digitally driven, and I'd rather kids understand how their devices work and not simply using them blindly! I looked at some of the different resources for coding in my post "Children's STEAM Festival: Exploring Kid's Opportunities in Technology (Coding, Making, Robotics and More!)" If you are looking for some ideas of how to get involved in computer coding with kids, this would be a great place to start. 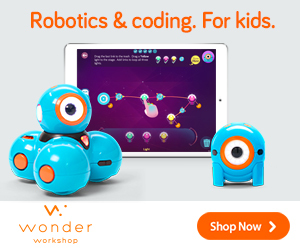 Let's look at some other resources for coding that involve devices and others that do not! 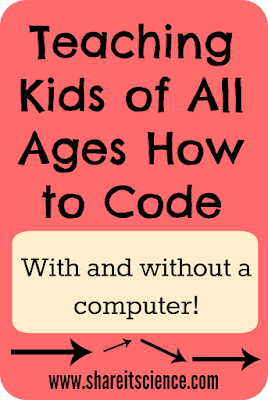 You are never too young or too old to develop coding skills! An excellent article on supporting classroom learning with computer science, particularly in Kindergarten with early readers is "Coding for Kindergarten" from Edutopia. 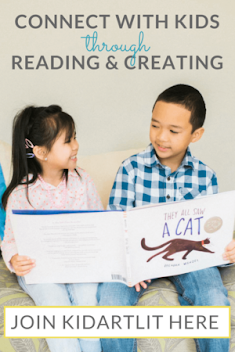 The author, Sam Patterson, a K-5 technology integration specialist very clearly lays out the skills that students learn when they begin to code. Things like counting, cause and effect, planning and problem-solving. Patterson also outlines how programming promotes social learning. "Coding Class, Then Naptime: Computer Science for the Kindergarten Set" is another great read illustrating how learning to code at a young age (with non-screen options) can set the foundation for learning in many areas. Checkers Math Pre-Coding without an App from Sugar Aunts blog. "Can Learning to Knit Help Learning to Code?" Teach coding through knitting!! Robot Turtles - a board game that secretly teaches coding to kids 4 and up. Dot and Dash are robots that teach kids how to code and program. Bee Bot is another robot geared towards very young children. This is a great tool to tie into other lessons in the classroom as it helps with sequencing and problem solving. There are tons of free and inexpensive apps and websites to teach coding. Check out Code Studio for activities on the screen and some that get kids moving to learn to code. Tynker is a free online coding course for kids age 5 and up. Daisy the Dinosaur is a free app that allows kids to learn the basics to programming their own computer game. Hopscotch teaches kids coding through game development as well. This is another free app that is directly linked to Hour of Code activities. Looking to teach coding to middle or high school? Check out curriculum resources at Code.org or CodeHS. 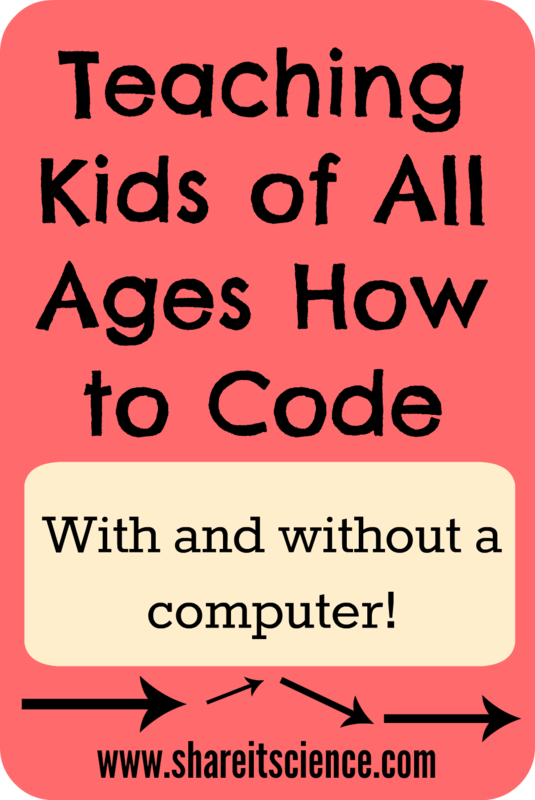 More great ideas at my Pinterest Board: Coding for Kids! I was out with my dog a few days ago and she began to wildly sniff one of our hydrangea bushes. The bush had many dried flowers and had caught a lot of deciduous tree leaves, so it was difficult to see what she might find so exciting. All of a sudden she jumped onto the bush, but it didn't support her weight, so she crashed down into it. As this happened I spotted some movement. At first I thought it was a small bird. Then as it jumped from the bush onto the split rail fence behind I recognized the creature immediately as a white-footed mouse, or deer mouse. Luckily my pup was still fixated on the bush and I was able to observe for a few seconds before we left the animal alone. White-footed mice are unmistakable with their two toned fur, brown on top and white on the belly and feet. They have bulgy shiny black button eyes and a long tail. Remembering seeing photographs of the white-footed mouse nesting in bird nests and other clumps of leaf and grass litter I wondered if it was possible that the mouse was nesting in the leaves that had been caught in the dense brittle branches of the hydrangea bush. Upon further research I learned many interesting and surprising things about this little mouse. 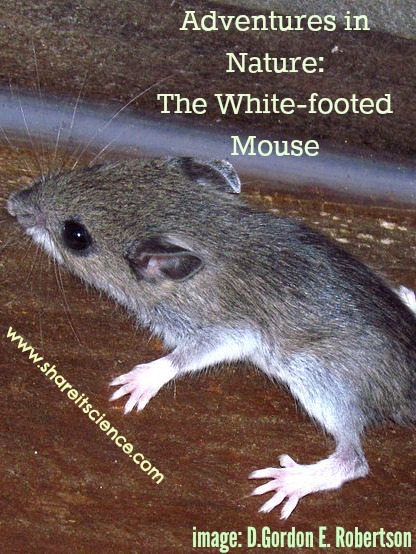 The white-footed mouse is primarily nocturnal to avoid predators and only lives about a year in the wild. They are excellent climbers and swimmers! For some unknown reason, this mouse will drum on hollow reeds or a dry leaf with their front feet to produce a low buzzing noise. It is not understood why they do this! Although I did not find out whether my hydrangea might be a good nesting spot, I did learn that they like to nest in warm and dry locations like hollow trees or abandoned bird nests. Although the mouse can carry disease through parasites like ticks that can harm humans, they have many positive attributes as well. 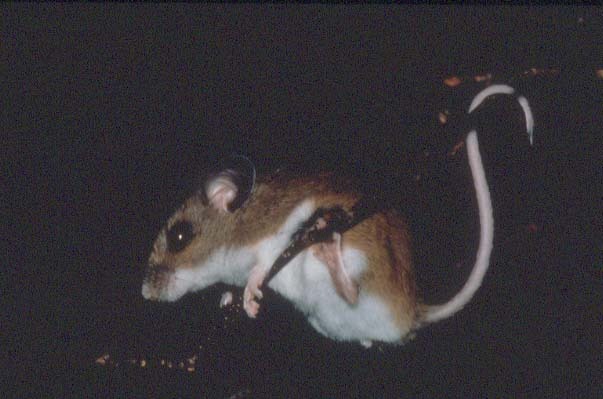 The white-footed mouse eats and helps to spread the spores of many types of fungi. This helps the trees of the forest because the mycorrhizae, or filamentous roots of fungus, help trees to absorb nutrients. They can also help to control populations of insect pests, like the invasive gypsy moth. These book suggestions are affiliate links. Please see disclosures for more details. Deer mouse at Old Farm Road is in the Smithsonian Backyard Series. These are mini-books written in a scientifically accurate way for kids. Whitefoot: A Story From the Center of the World by environmental author Wendell Berry is another tiny book for children and adults. There is always more to find out when you look a little closer! What natural discoveries have you made recently? Share with us on Facebook, by e-mail or by commenting below.